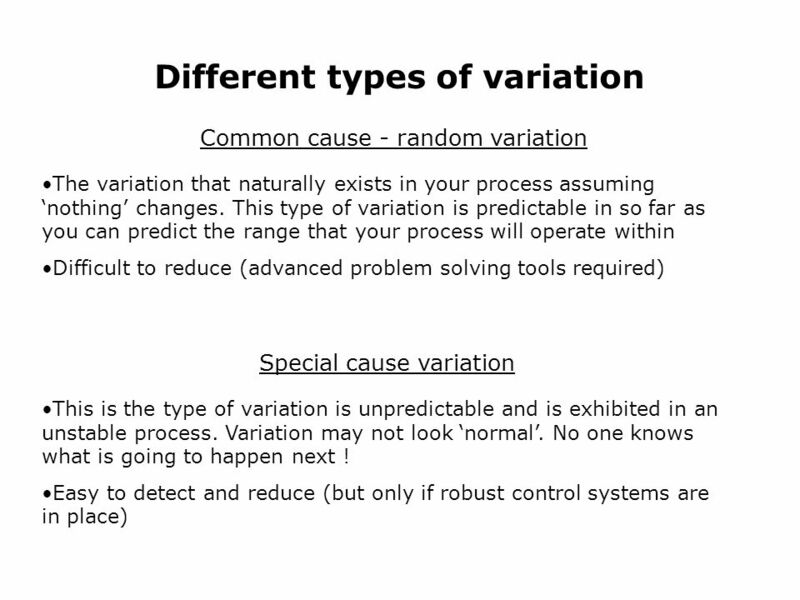 Six Sigma - Variation. 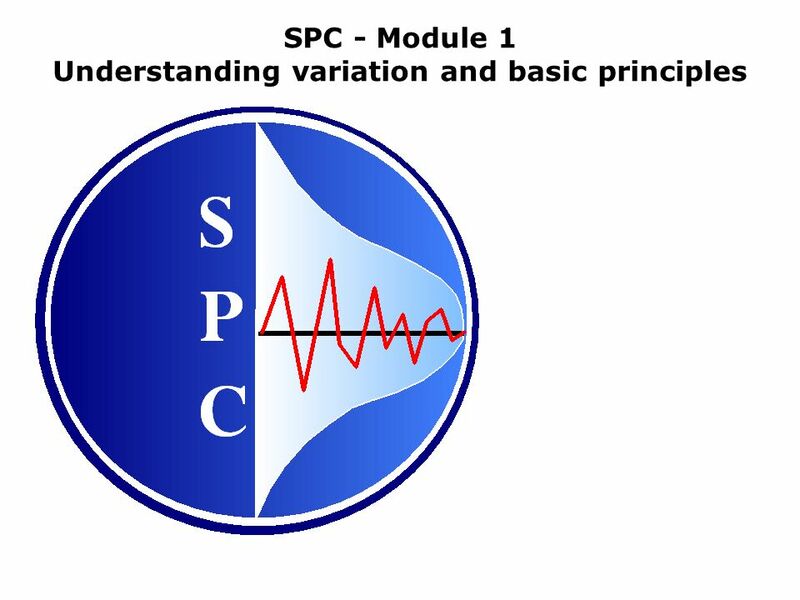 SPC - Module 1 Understanding variation and basic principles. 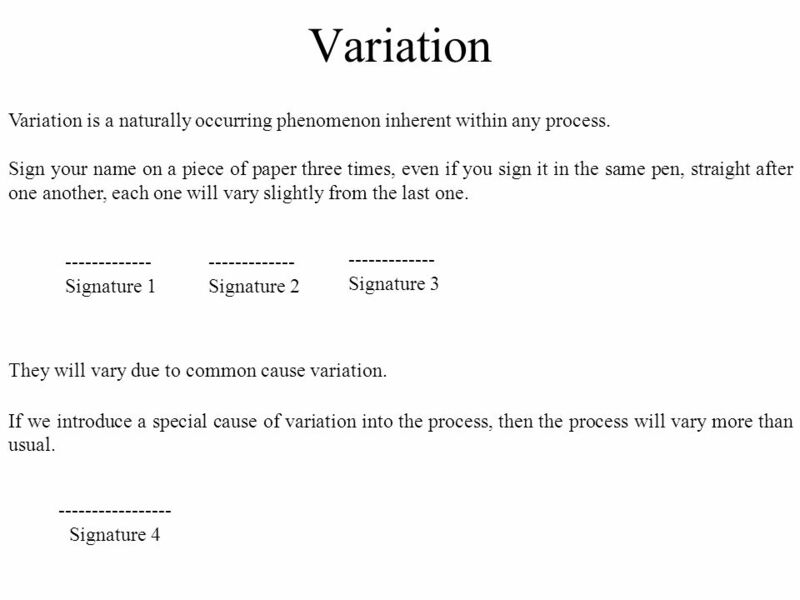 5 Variation No two products or processes are exactly alike. 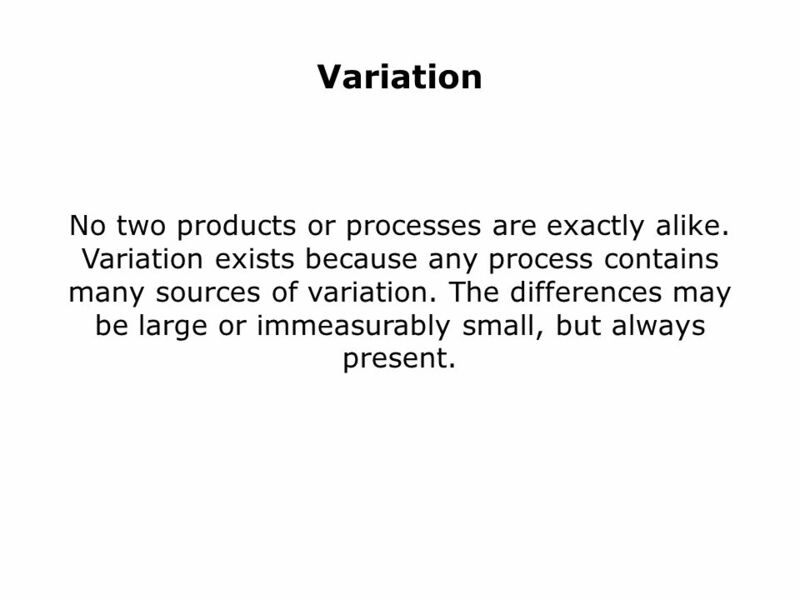 Variation exists because any process contains many sources of variation. 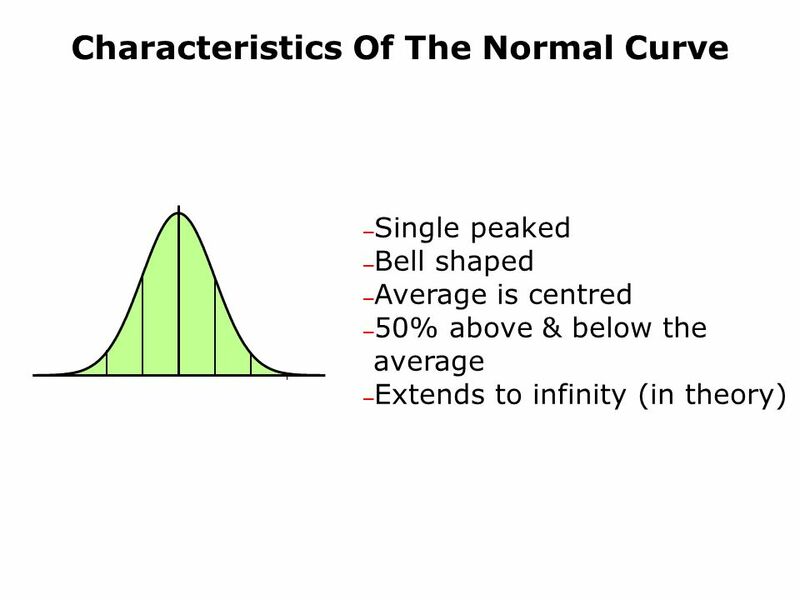 The differences may be large or immeasurably small, but always present. 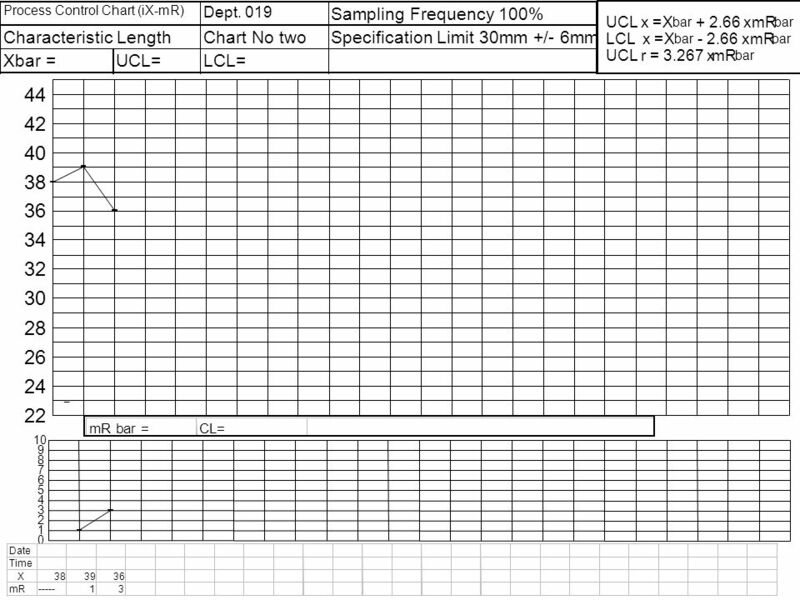 9 So what to do….? 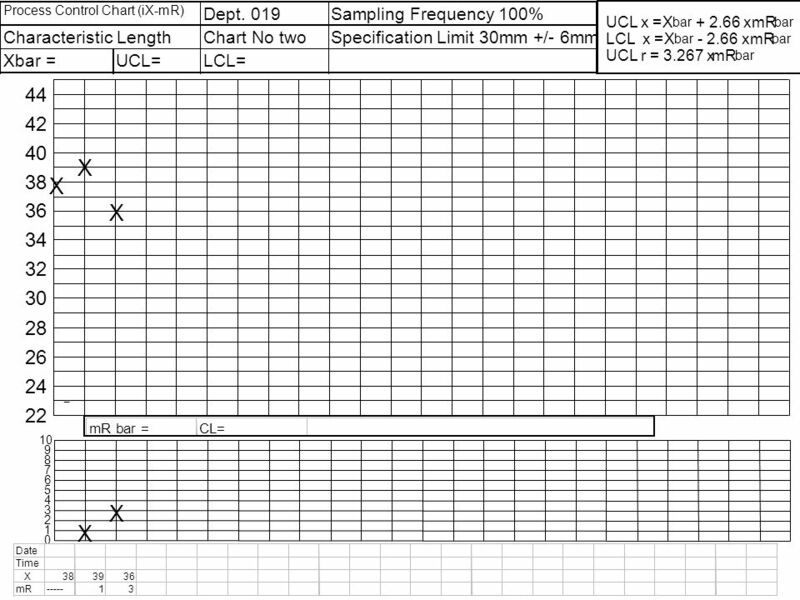 Commit to improving quality - make process capability measurable and reportable. 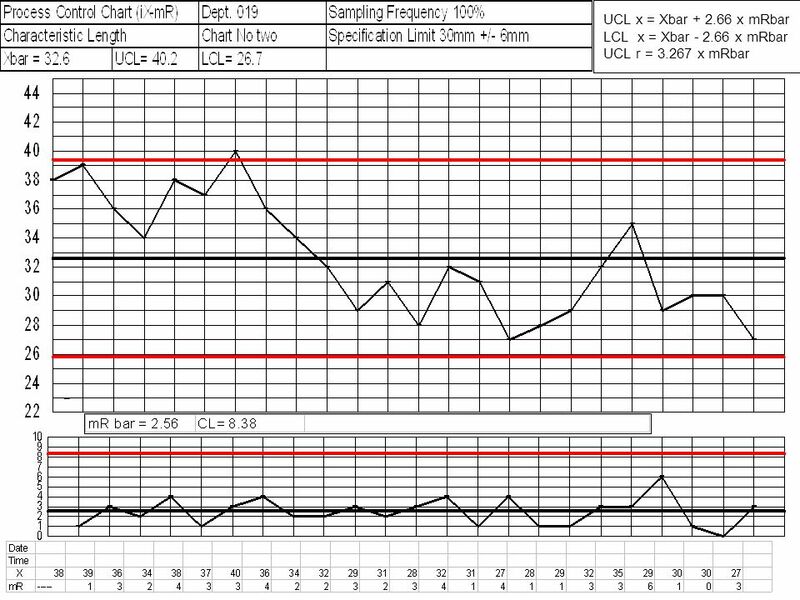 So we will know we are getting better. Solve problems as a team rather than individuals. 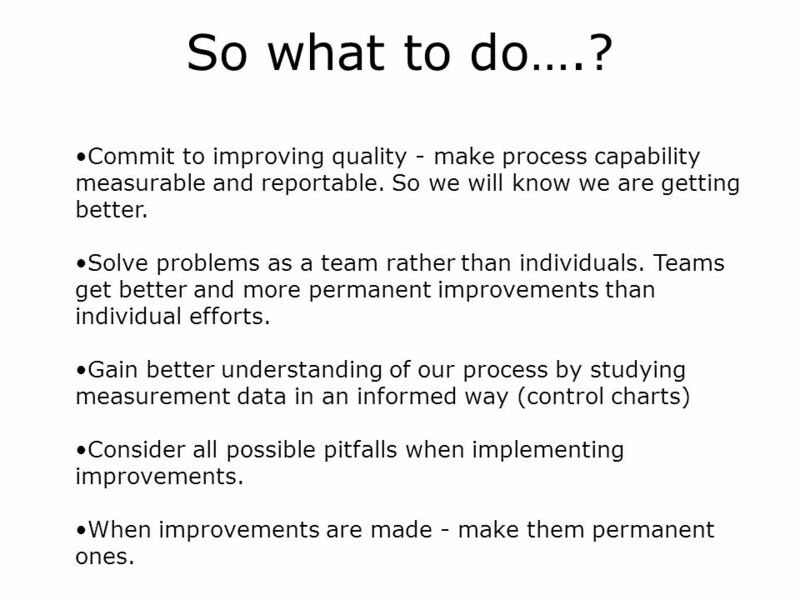 Teams get better and more permanent improvements than individual efforts. 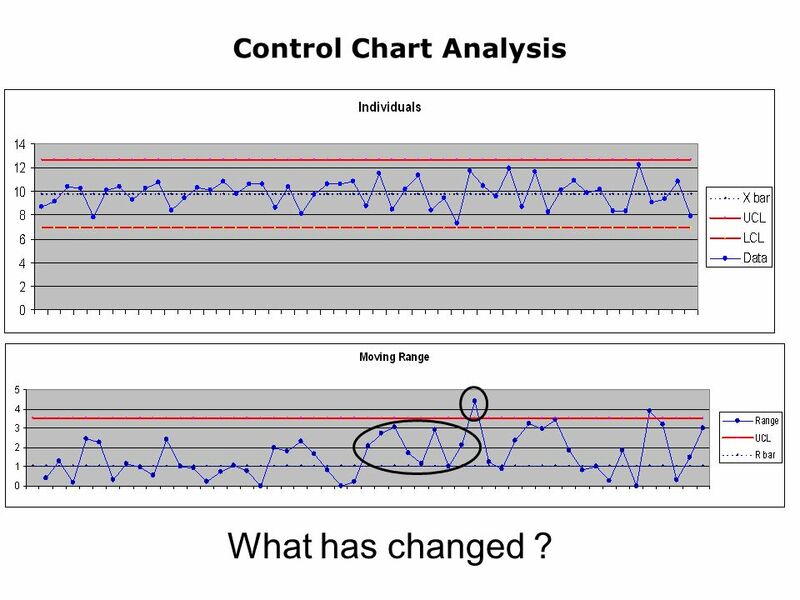 Gain better understanding of our process by studying measurement data in an informed way (control charts) Consider all possible pitfalls when implementing improvements. 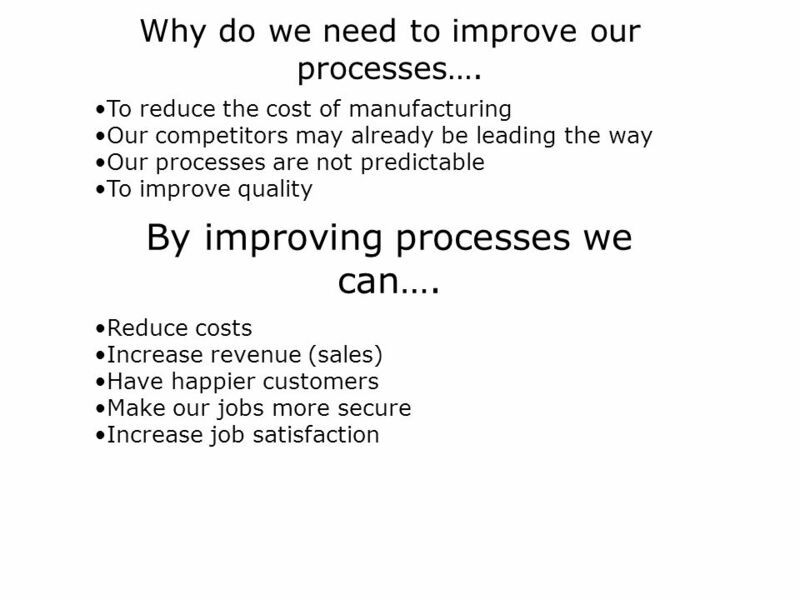 When improvements are made - make them permanent ones. 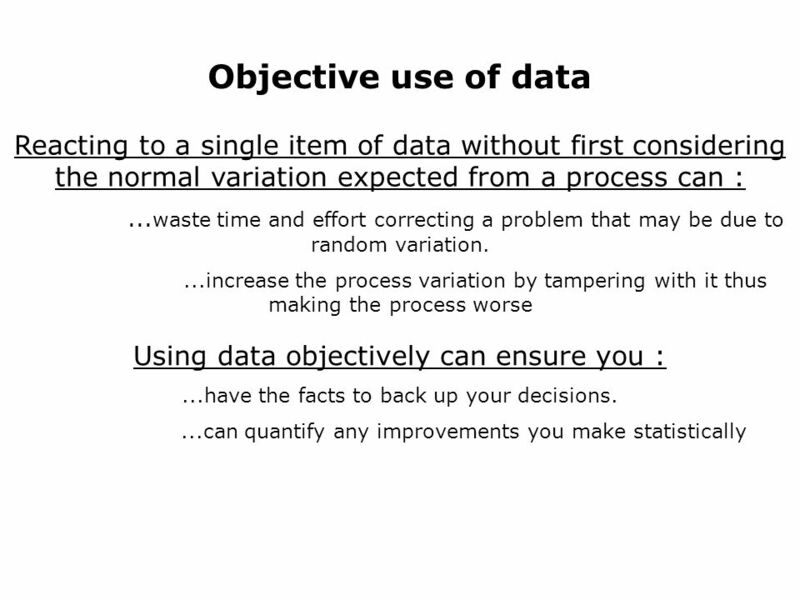 10 Quality of data: We may have lots of data, but …. 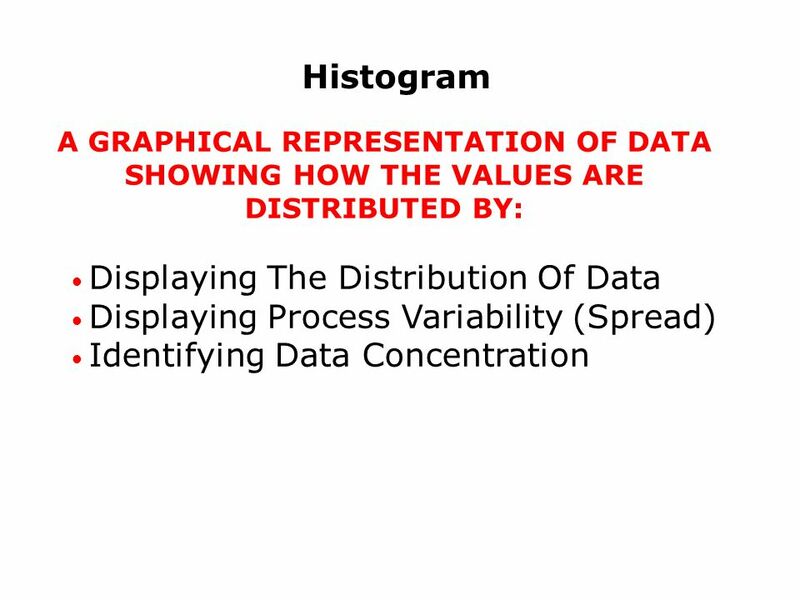 Does it represent the process outputs we are interested in ? 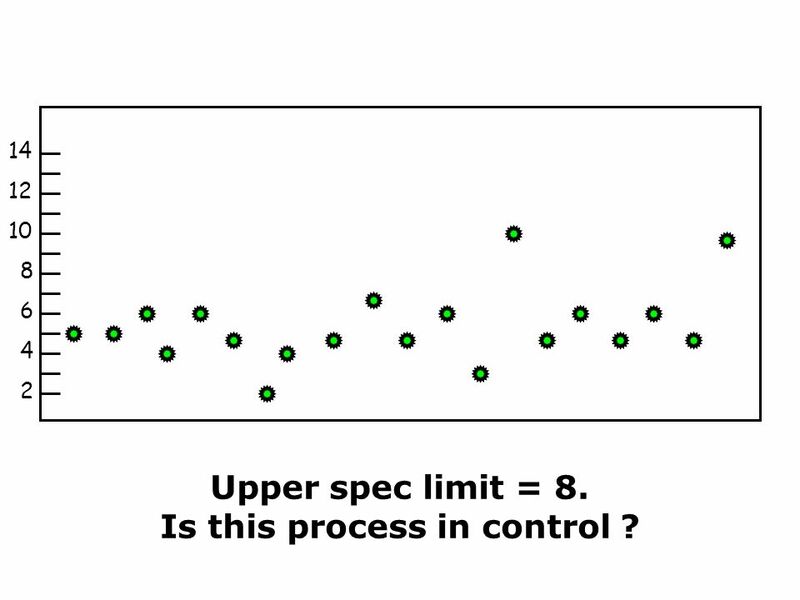 Is it representative of our current process ? 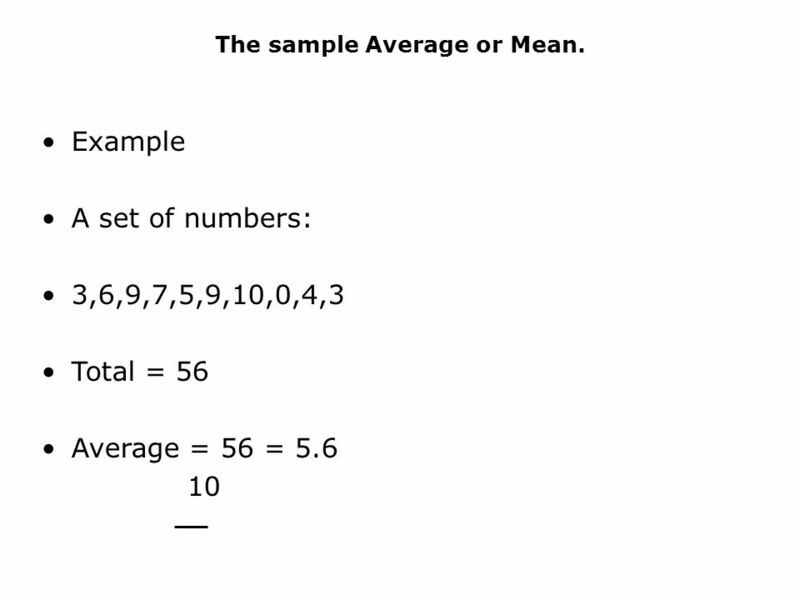 Can we split it into subsets to aid problem solving ? 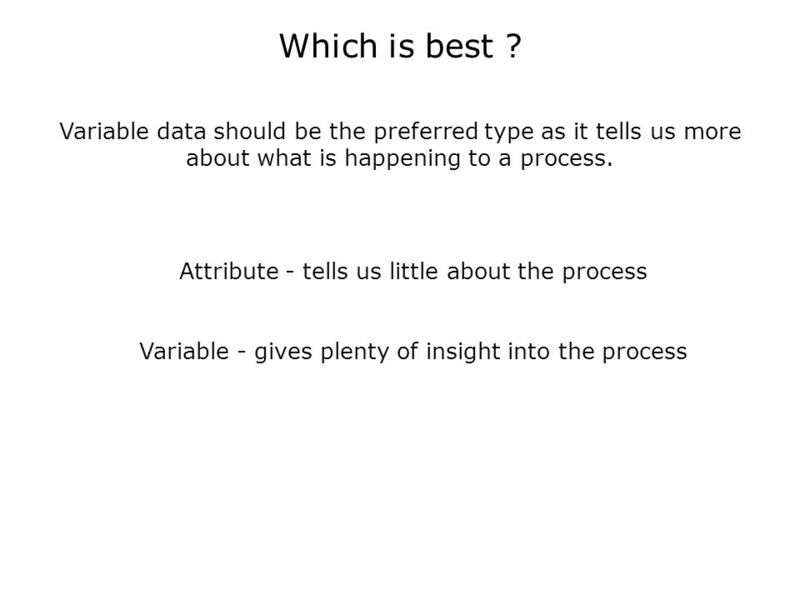 Can it be paired with process inputs ? 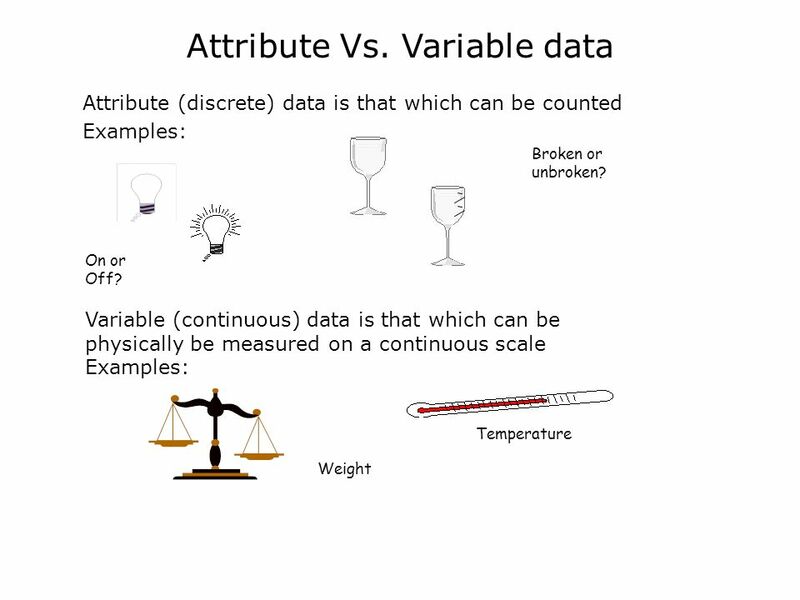 Is the operational definition for how measurements are taken and data recorded ? 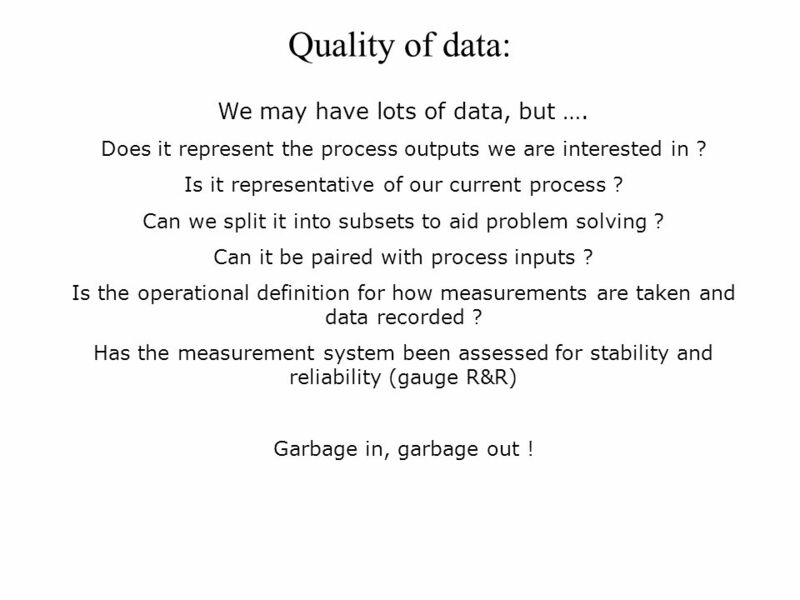 Has the measurement system been assessed for stability and reliability (gauge R&R) Garbage in, garbage out ! 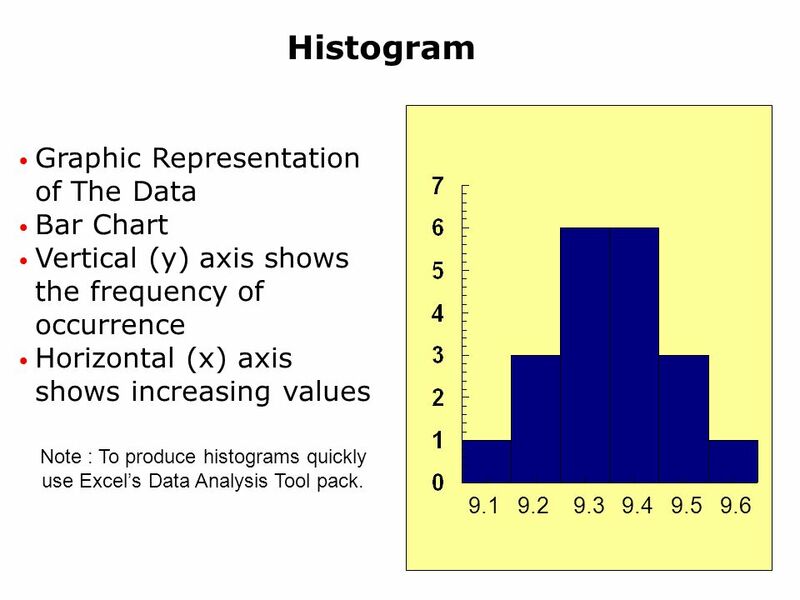 15 Histogram Graphic Representation of The Data Bar Chart Vertical (y) axis shows the frequency of occurrence Horizontal (x) axis shows increasing values 9.1 9.2 9.3 9.4 9.5 9.6 Note : To produce histograms quickly use Excels Data Analysis Tool pack. 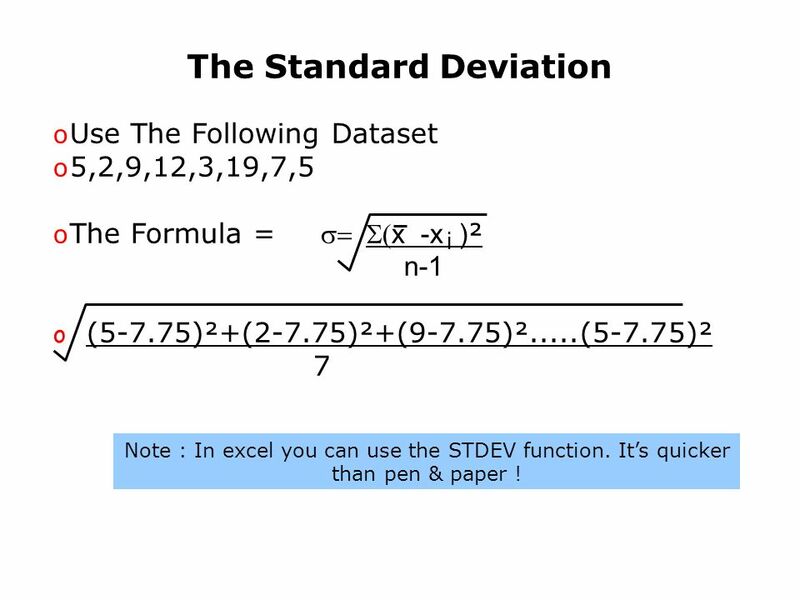 21 The Standard Deviation o Use The Following Dataset o 5,2,9,12,3,19,7,5 o The Formula = x -x ) ² n-1 o (5-7.75)²+(2-7.75)²+(9-7.75)².....(5-7.75)² 7 i Note : In excel you can use the STDEV function. 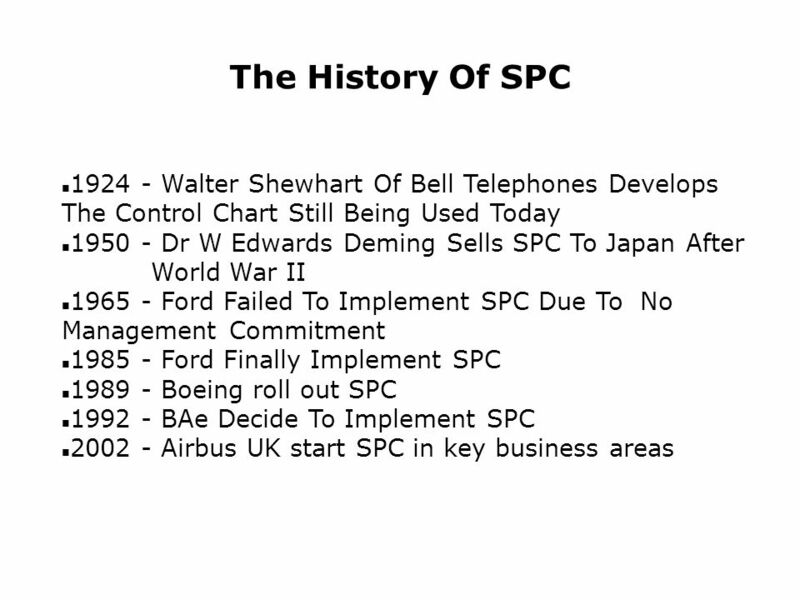 Its quicker than pen & paper ! 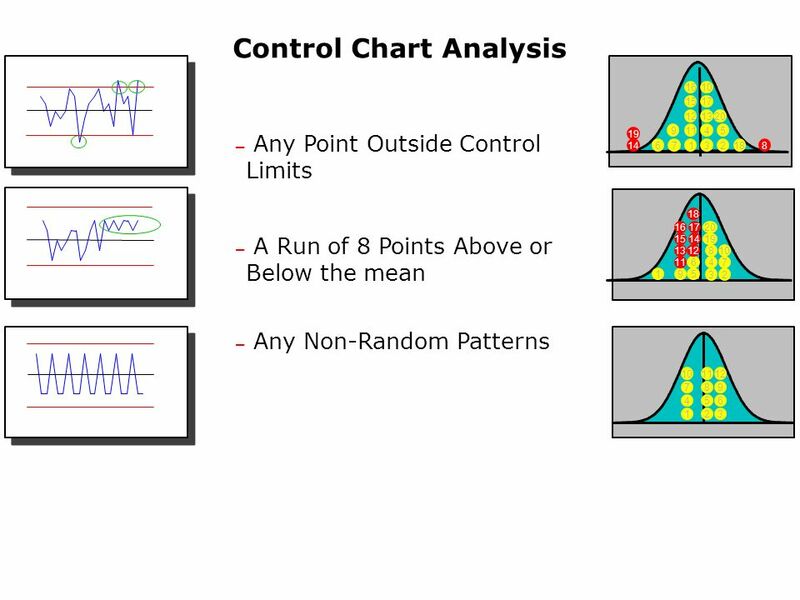 25 Control charts A control chart is a run chart with control limits plotted on it. 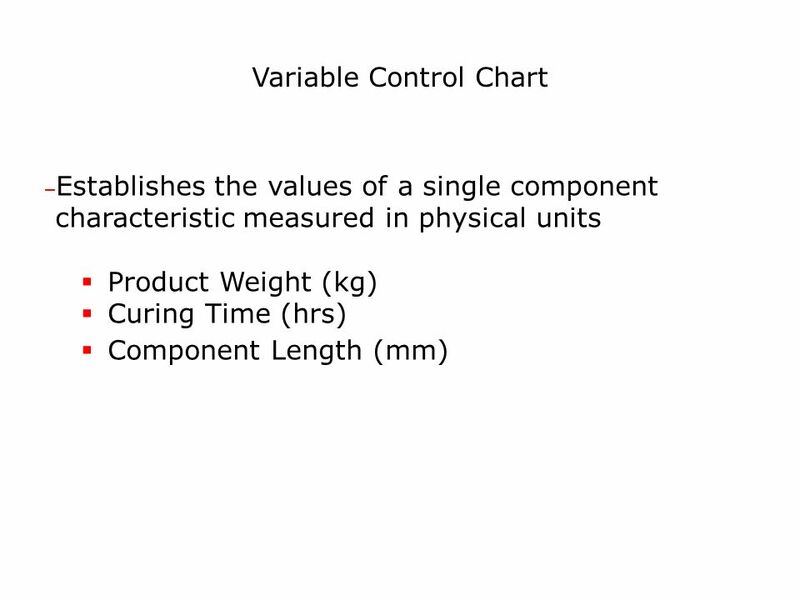 A control chart can be used to check whether a process is predictable within a range of values Control limits are an estimation of 3 standard deviations either side of the mean. 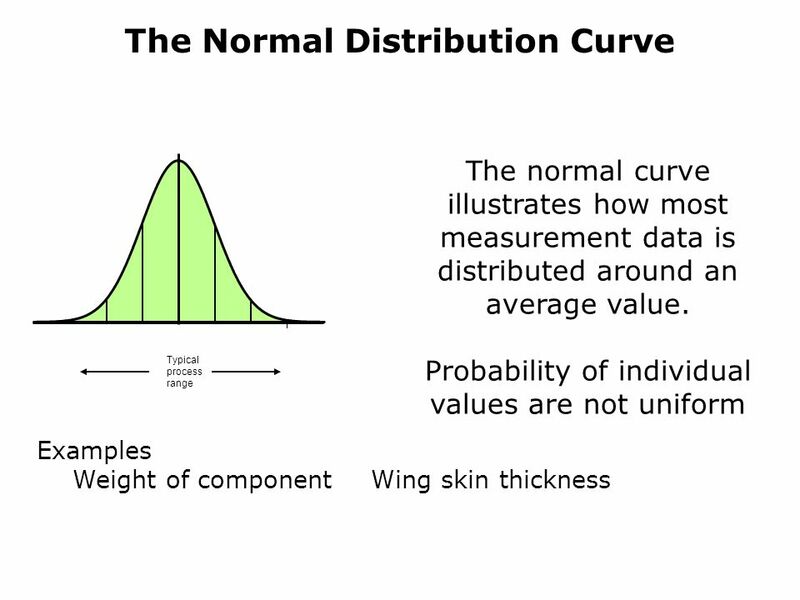 99.74% of data should be within 3 standard deviations of the mean if no special cause variation is present. 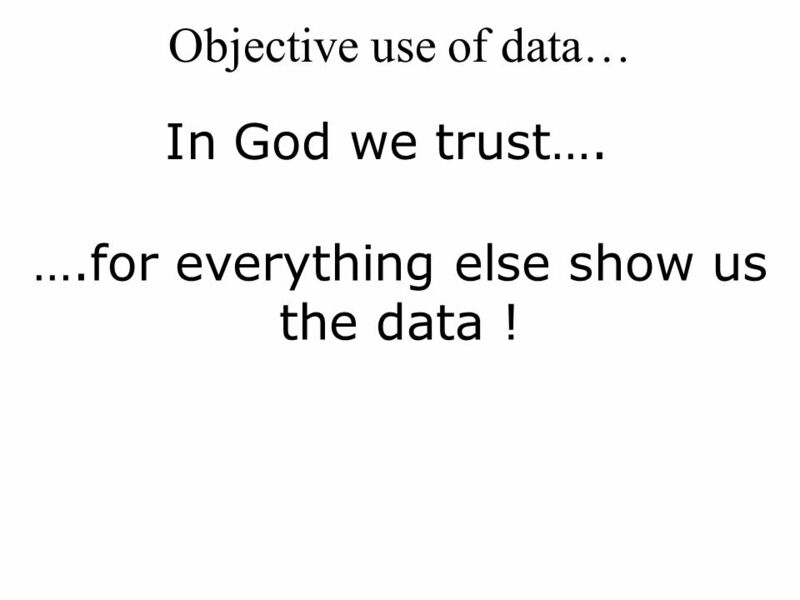 29 Objective use of data… In God we trust…. ….for everything else show us the data ! 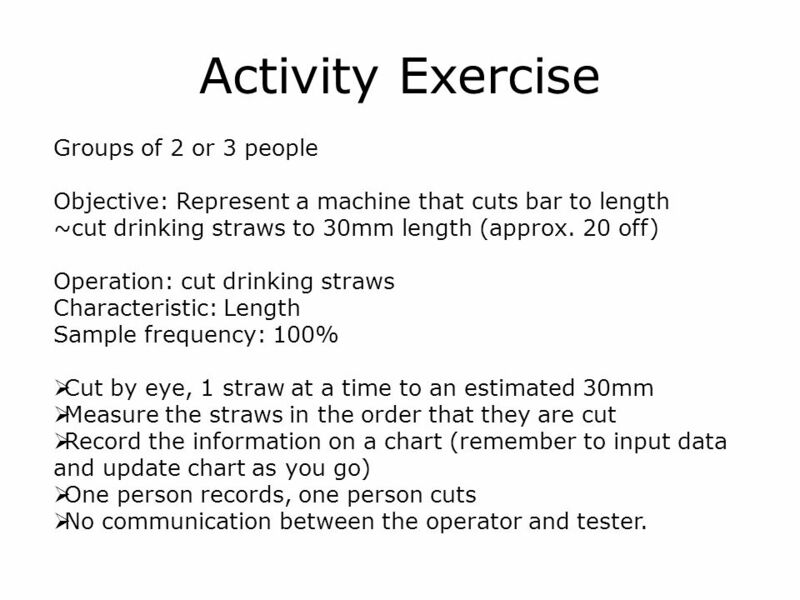 36 Activity Exercise Groups of 2 or 3 people Objective: Represent a machine that cuts bar to length ~cut drinking straws to 30mm length (approx. 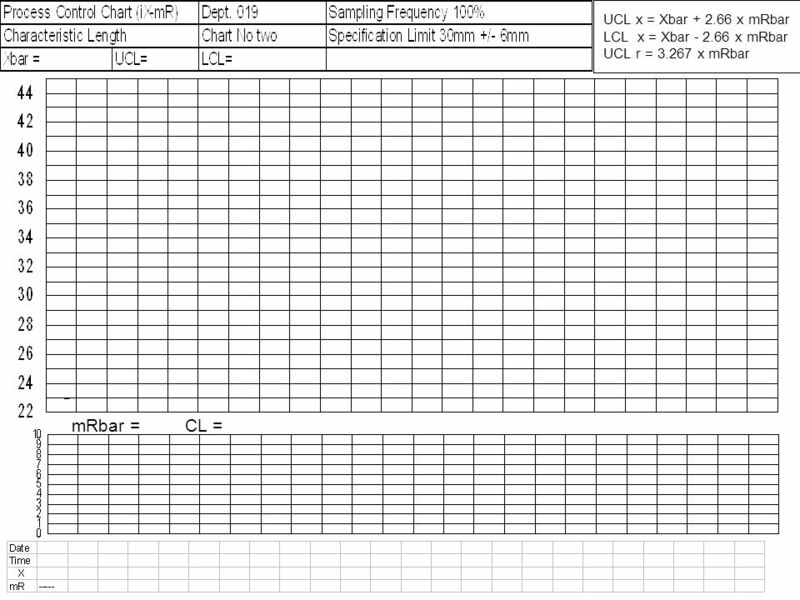 20 off) Operation: cut drinking straws Characteristic: Length Sample frequency: 100% Cut by eye, 1 straw at a time to an estimated 30mm Measure the straws in the order that they are cut Record the information on a chart (remember to input data and update chart as you go) One person records, one person cuts No communication between the operator and tester. 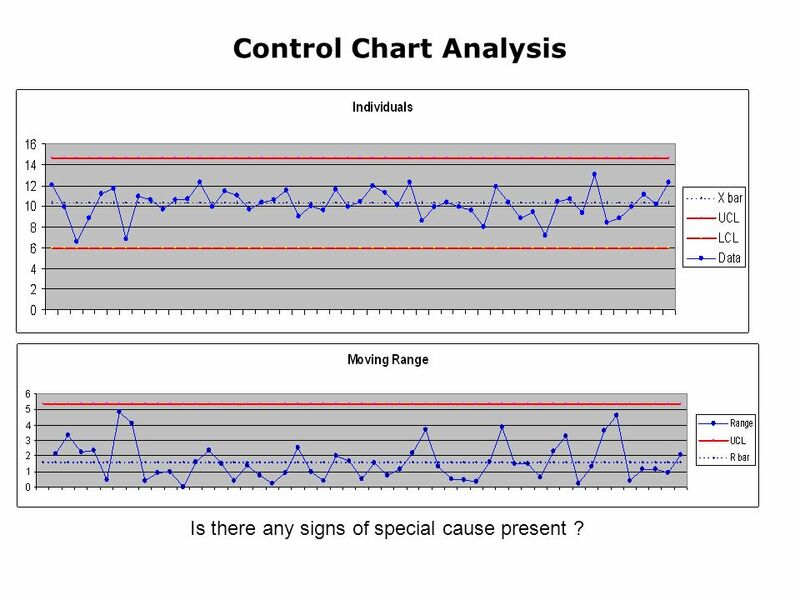 46 Control Chart Analysis Is there any signs of special cause present ? 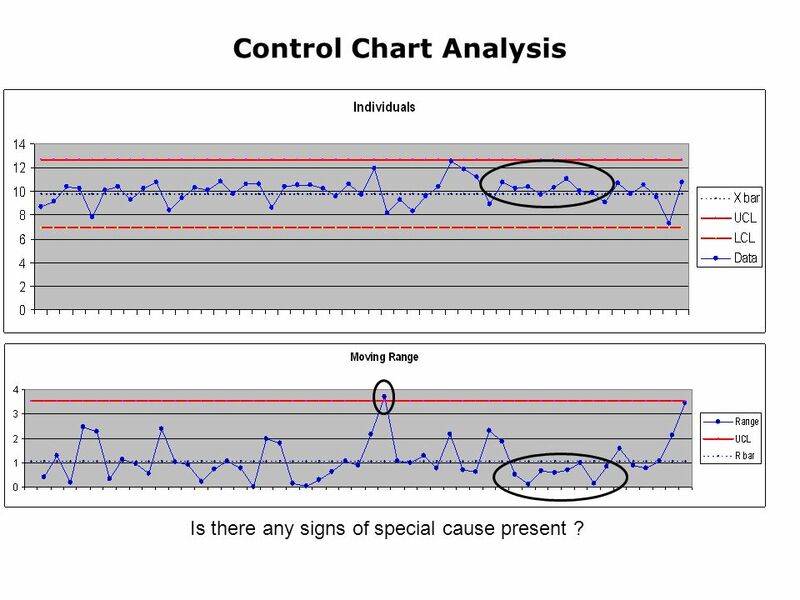 47 Control Chart Analysis Is there any signs of special cause present ? 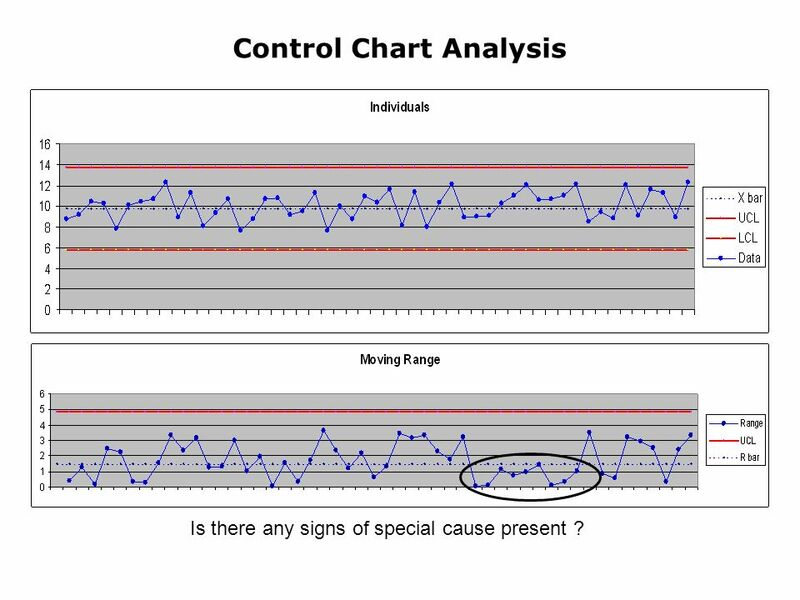 48 Control Chart Analysis Is there any signs of special cause present ? 49 Control Chart Analysis Any special cause here ? 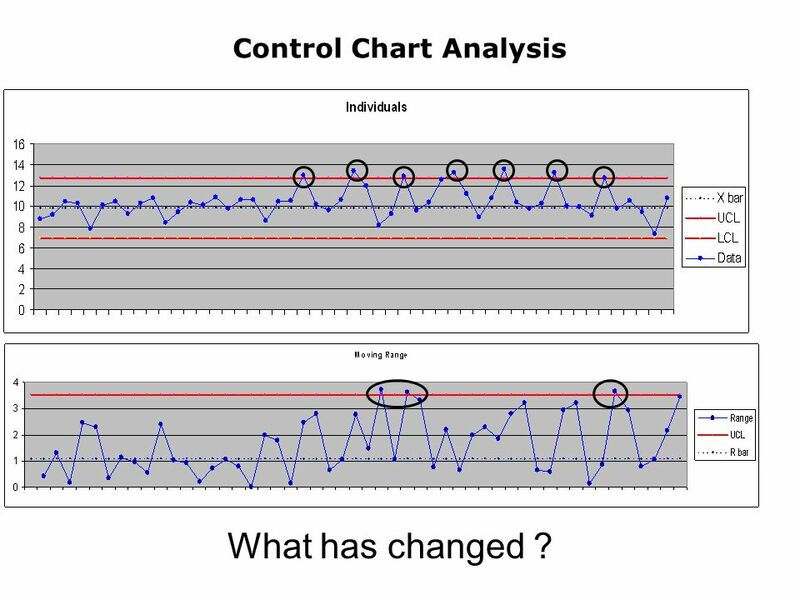 50 Control Chart Analysis What has changed ? 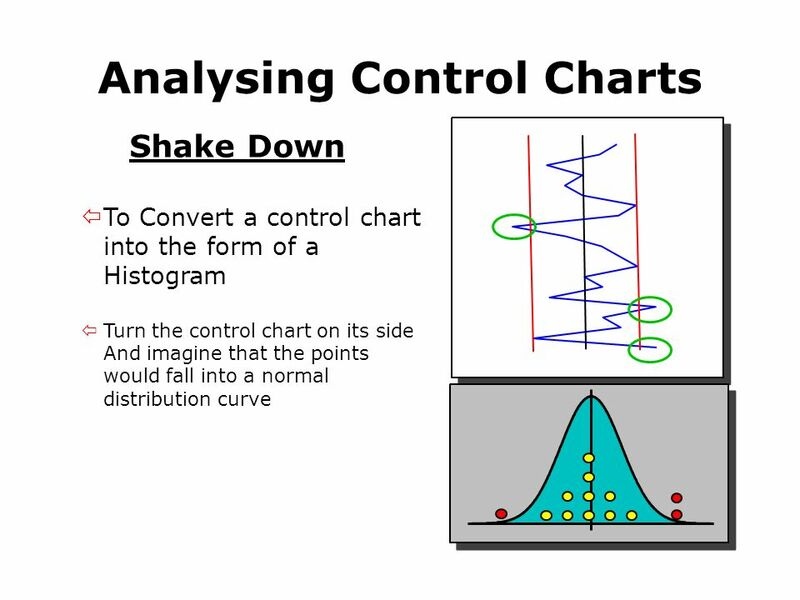 51 Control Chart Analysis What has changed ? 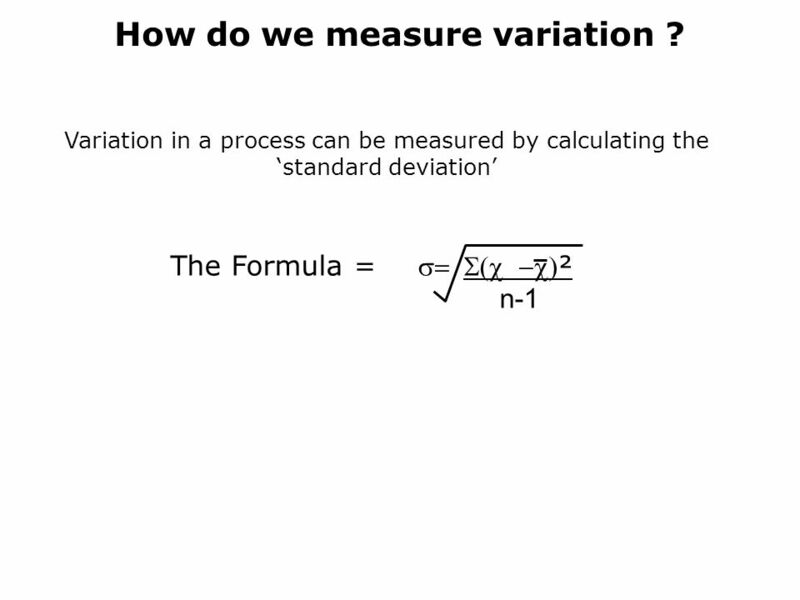 52 Now make a change to the process Is the process in control ? 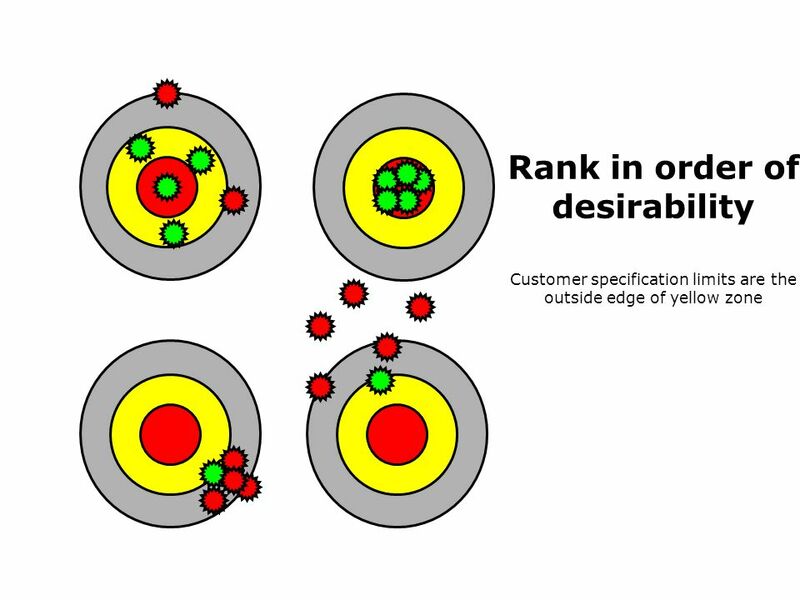 Is there a better way of meeting your customers needs ? 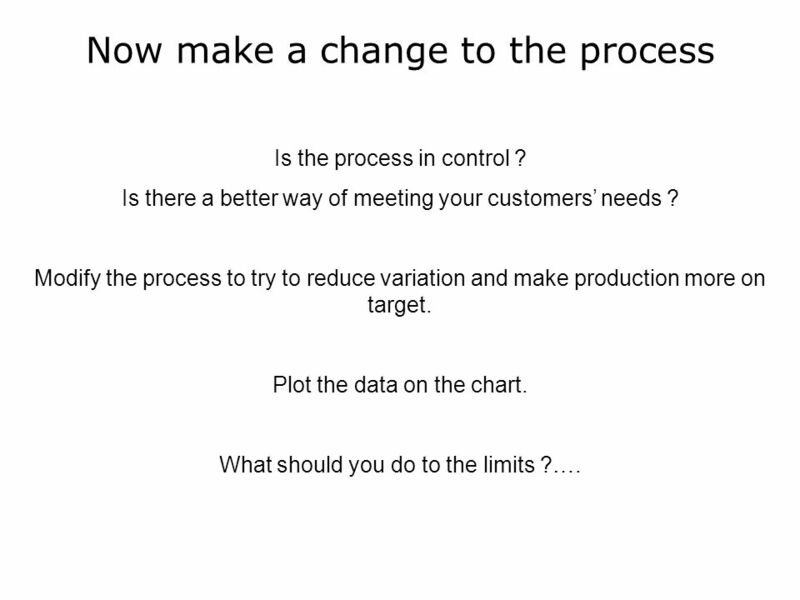 Modify the process to try to reduce variation and make production more on target. 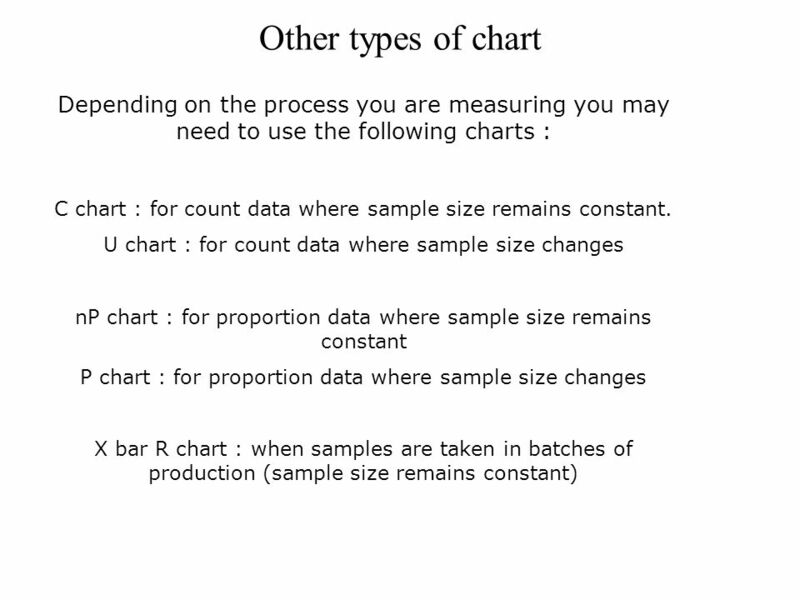 Plot the data on the chart. 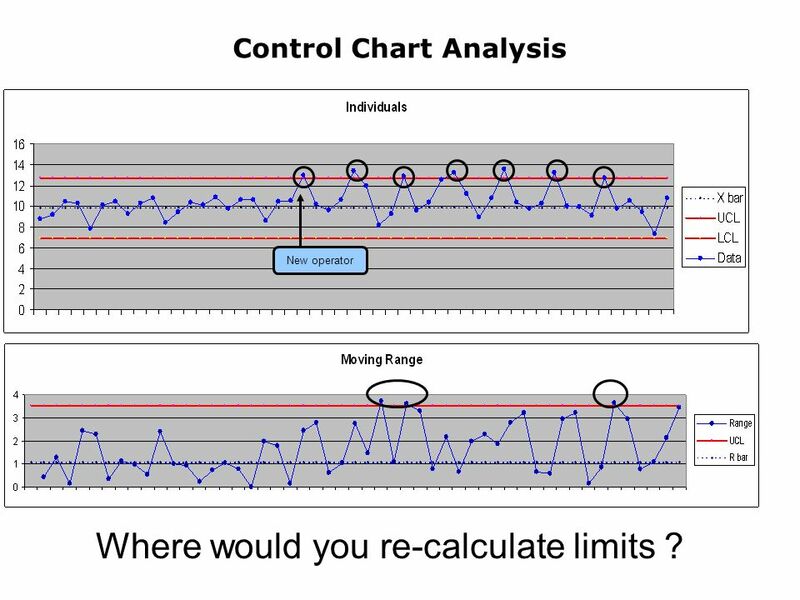 What should you do to the limits ?…. 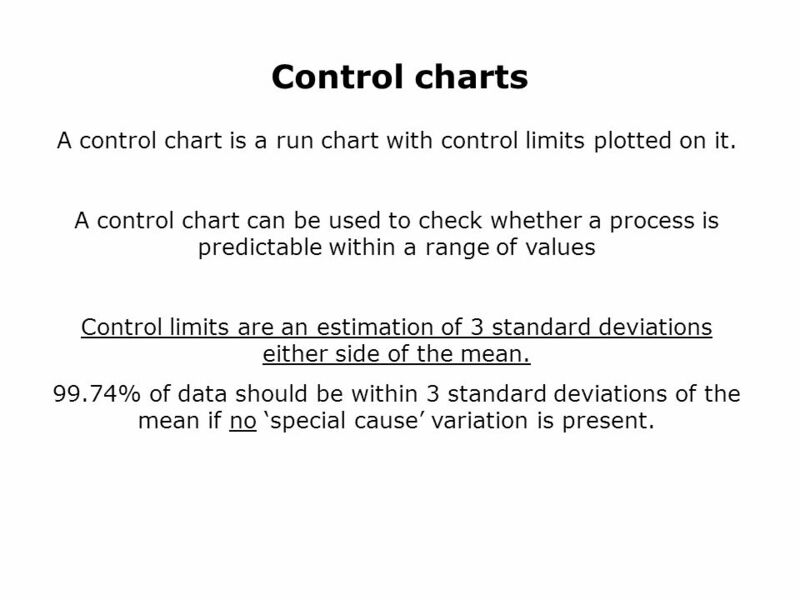 54 Calculating Control limits When calculating limits remove any special causes that you know the reason for. 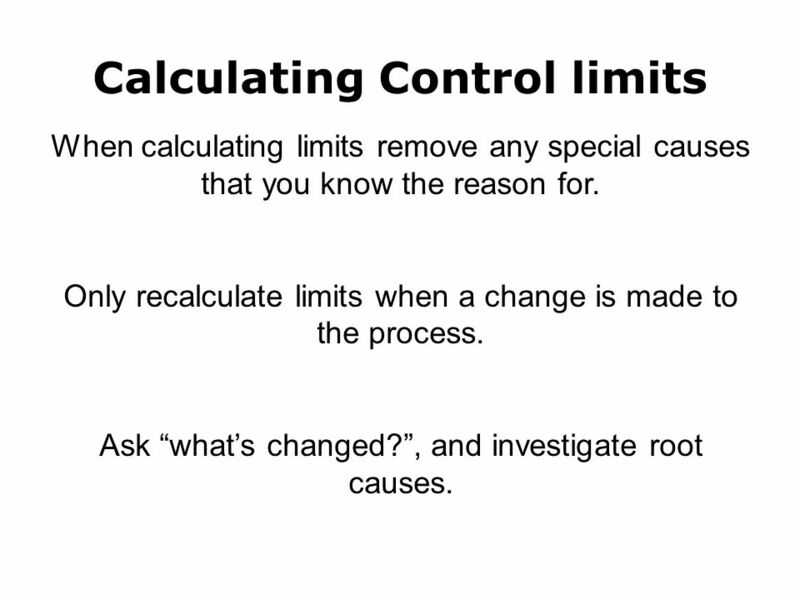 Only recalculate limits when a change is made to the process. 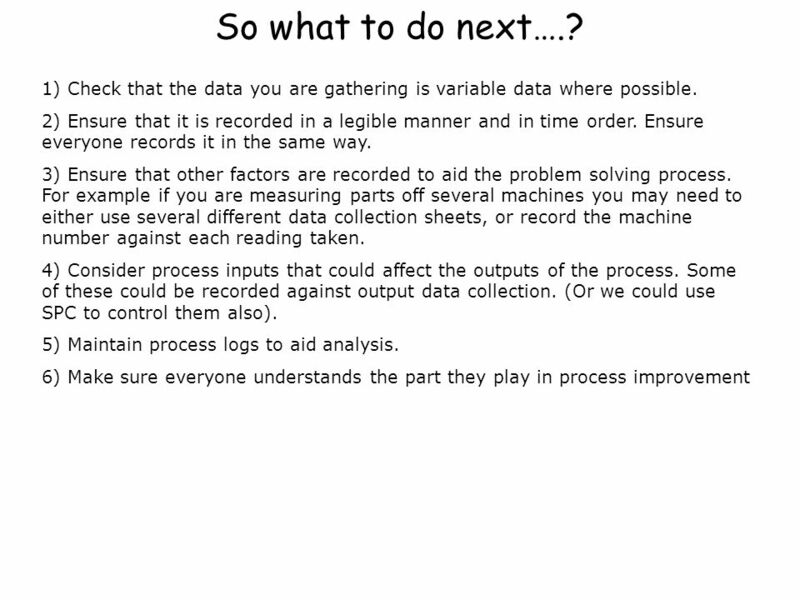 Ask whats changed?, and investigate root causes. 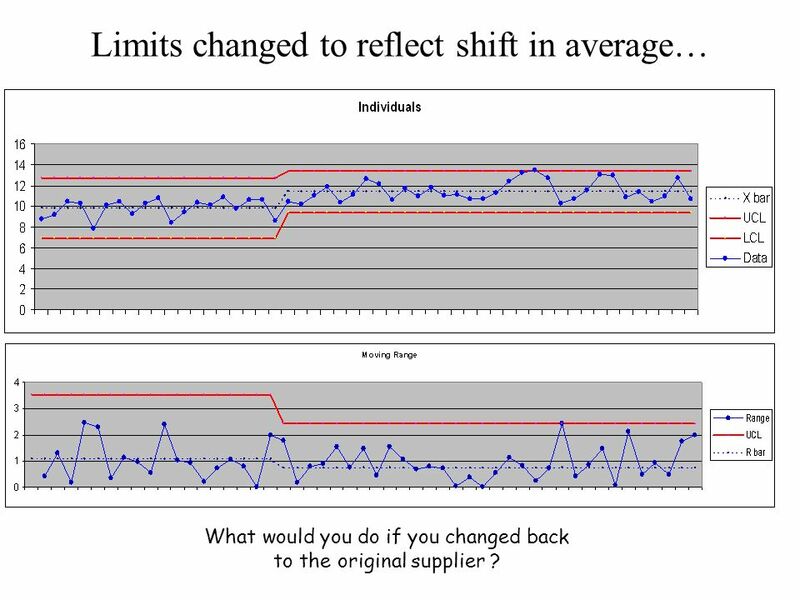 56 Limits changed to reflect shift in average… What would you do if you changed back to the original supplier ? 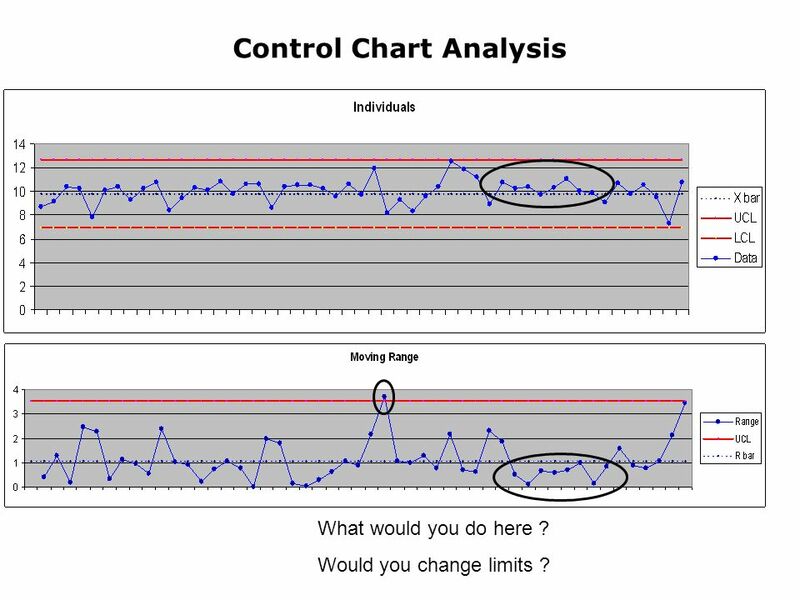 58 Control Chart Analysis What would you do here ? 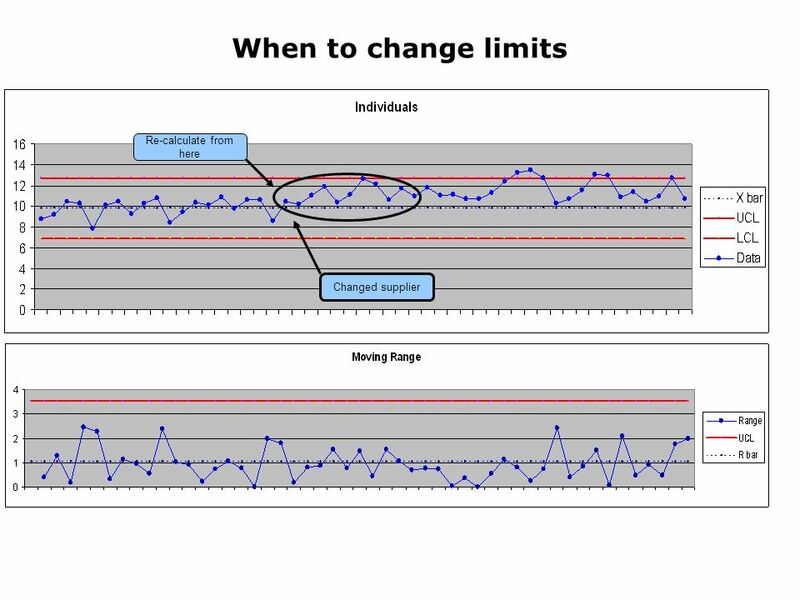 Would you change limits ? 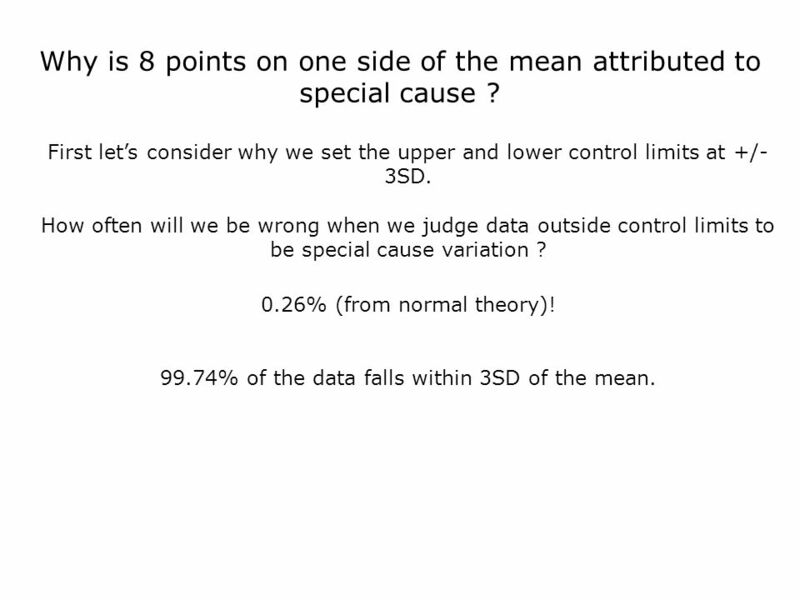 59 Why is 8 points on one side of the mean attributed to special cause ? 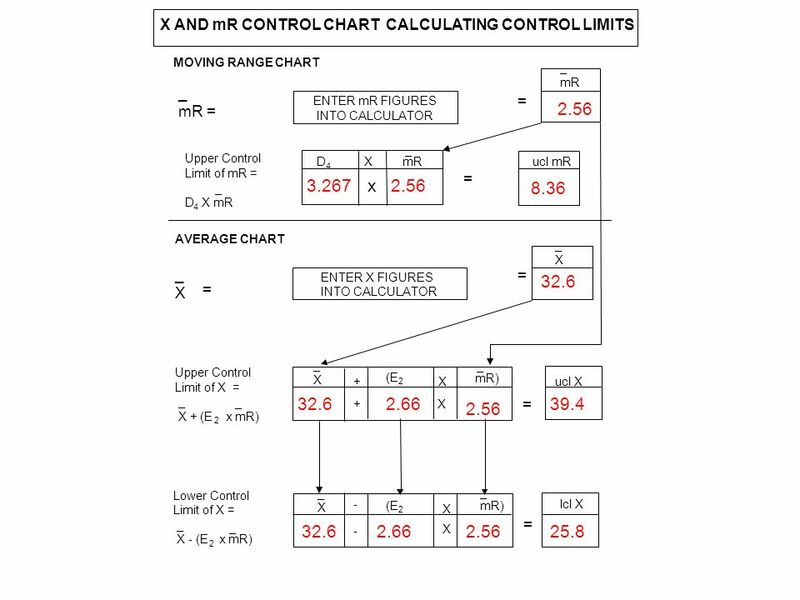 First lets consider why we set the upper and lower control limits at +/- 3SD. 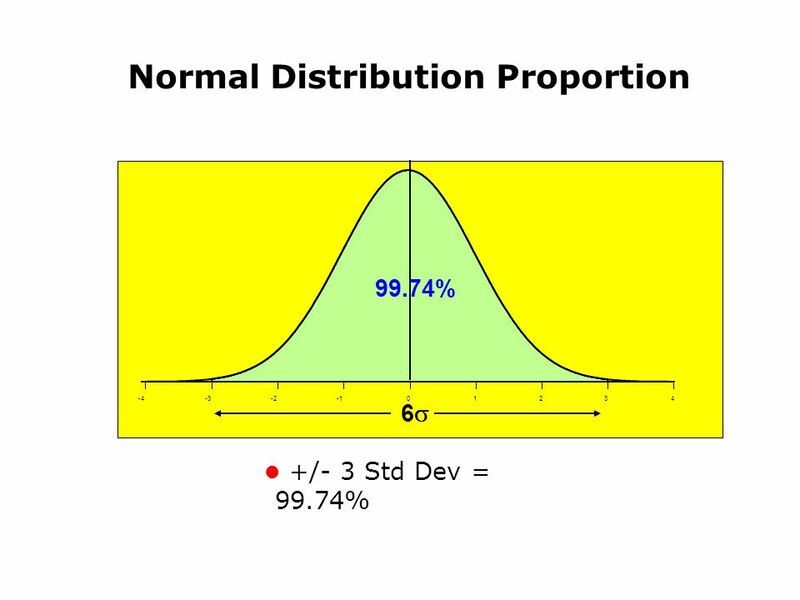 99.74% of the data falls within 3SD of the mean. 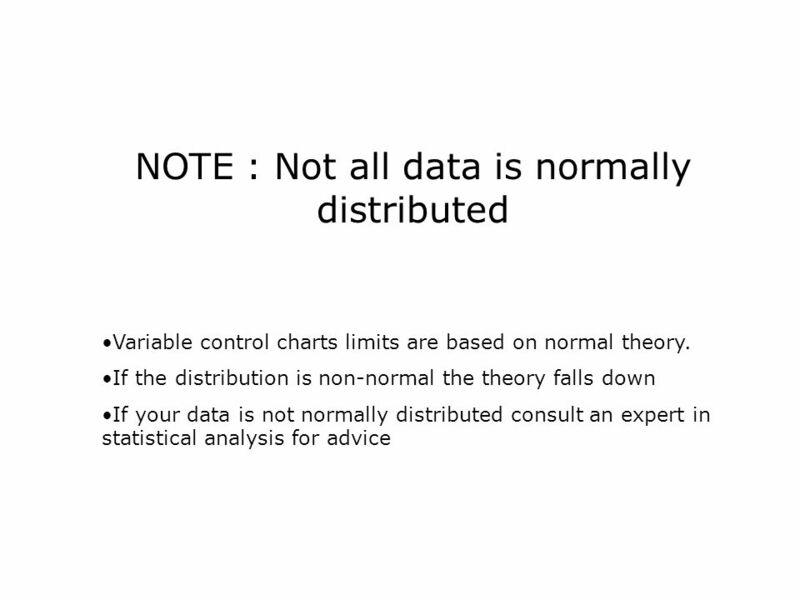 How often will we be wrong when we judge data outside control limits to be special cause variation ? 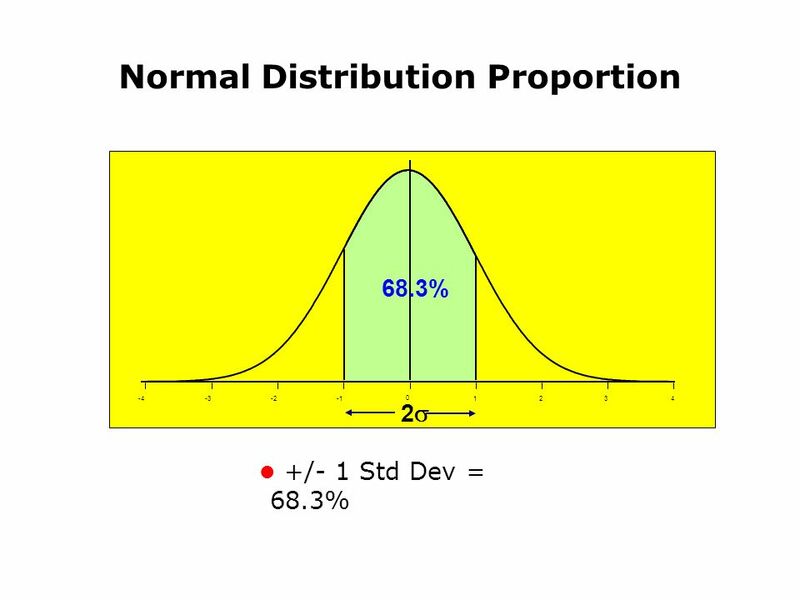 0.26% (from normal theory)! 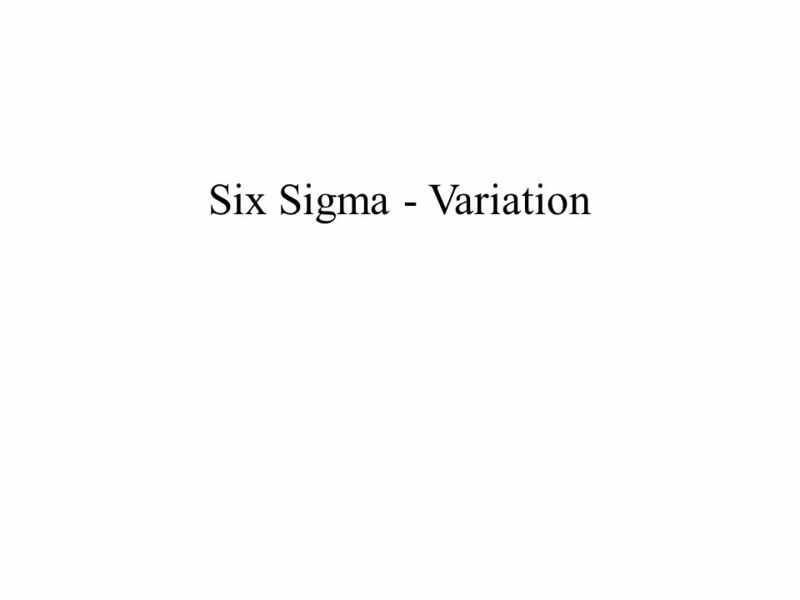 Download ppt "Six Sigma - Variation. 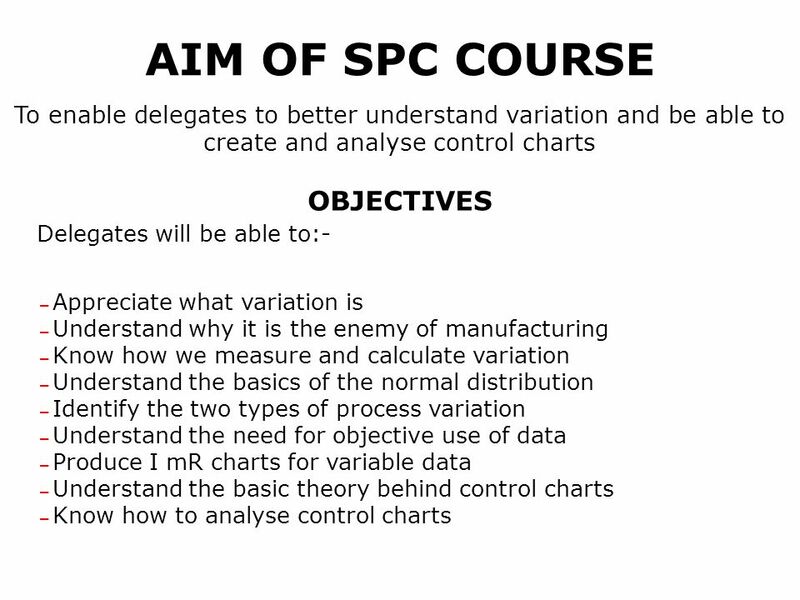 SPC - Module 1 Understanding variation and basic principles." 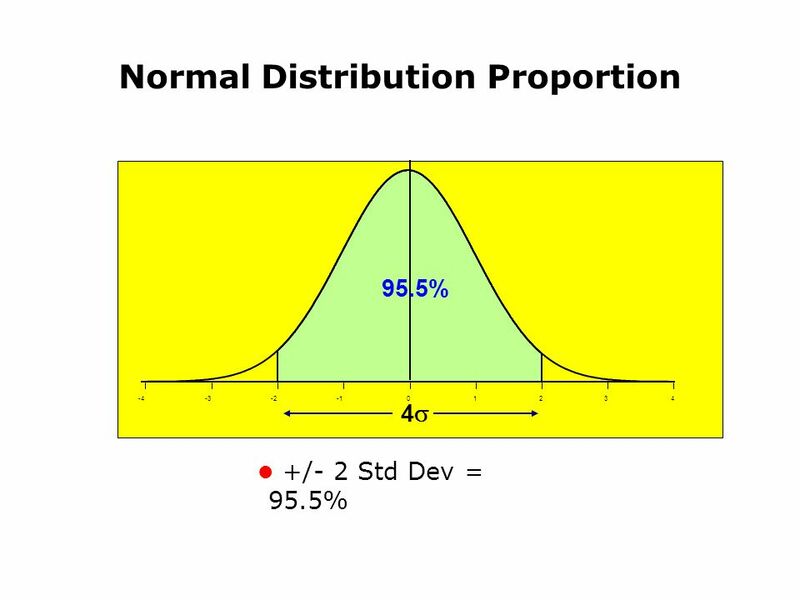 Copyright © 2010 Pearson Education, Inc. Slide The number of sweatshirts a vendor sells daily has the following probability distribution. 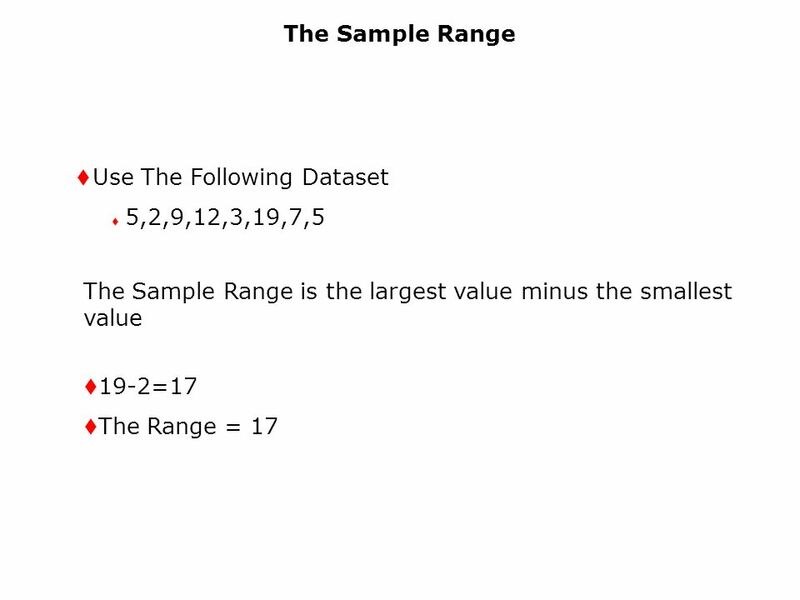 Num of. 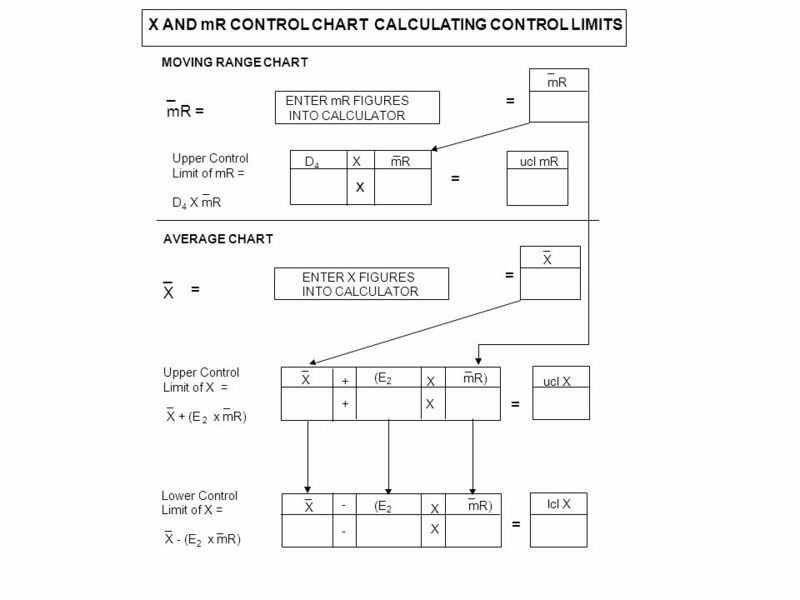 1 © The McGraw-Hill Companies, Inc., 2006 McGraw-Hill/Irwin Technical Note 9 Process Capability and Statistical Quality Control. 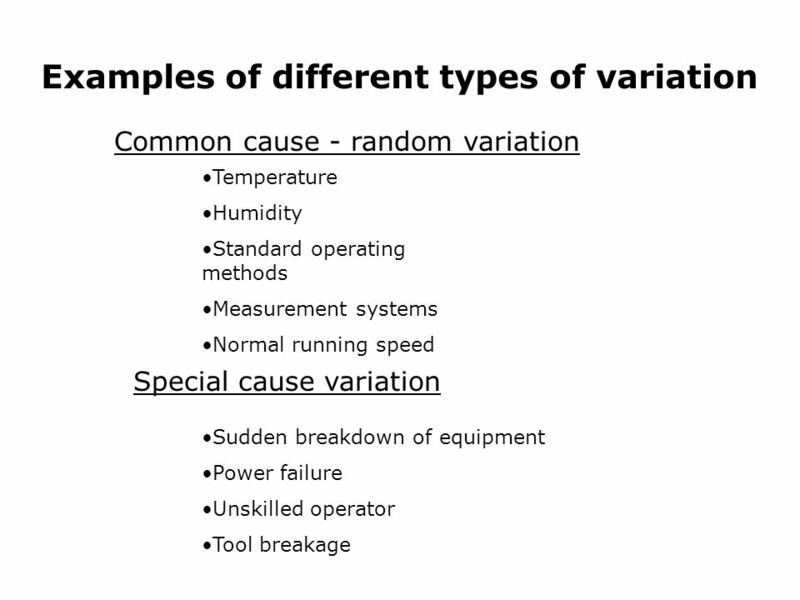 1 Manufacturing Process A sequence of activities that is intended to achieve a result (Juran). 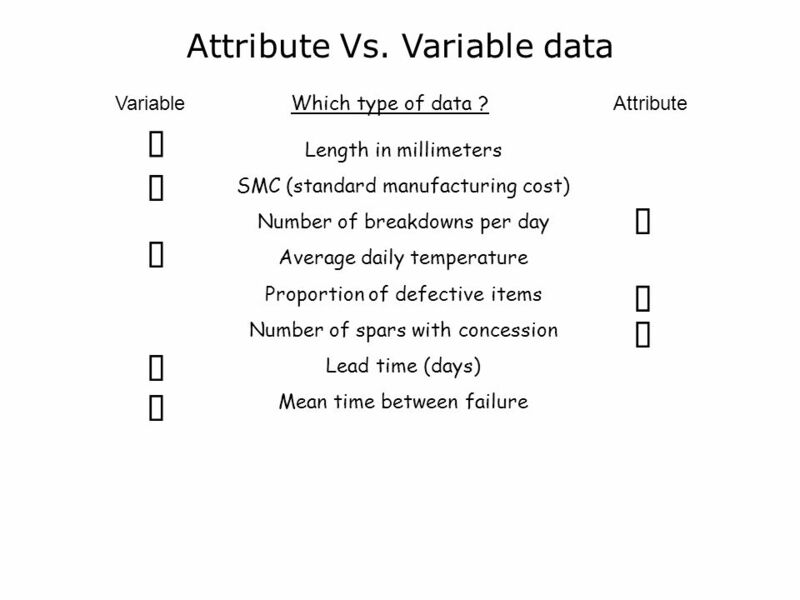 Quality of Manufacturing Process depends on Entry Criteria. 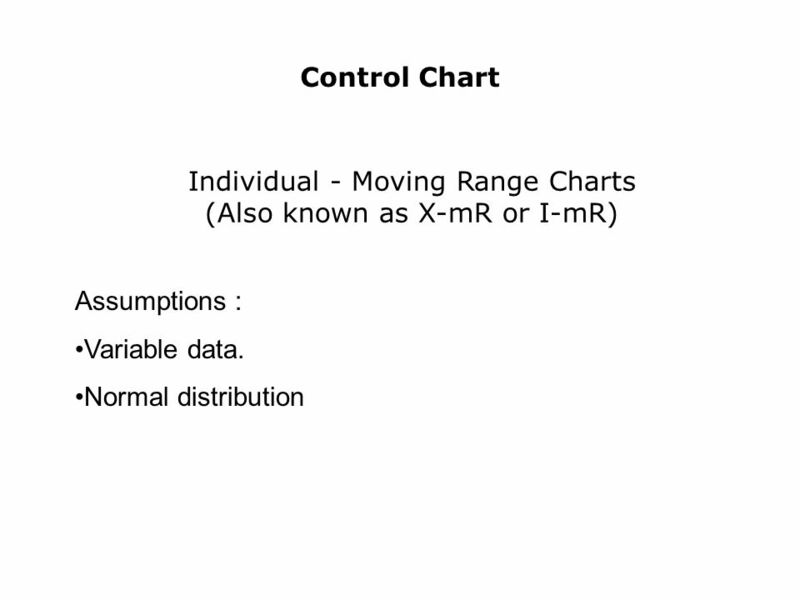 ENGM 620: Quality Management Session 8 – 23 October 2012 Control Charts, Part I –Variables. 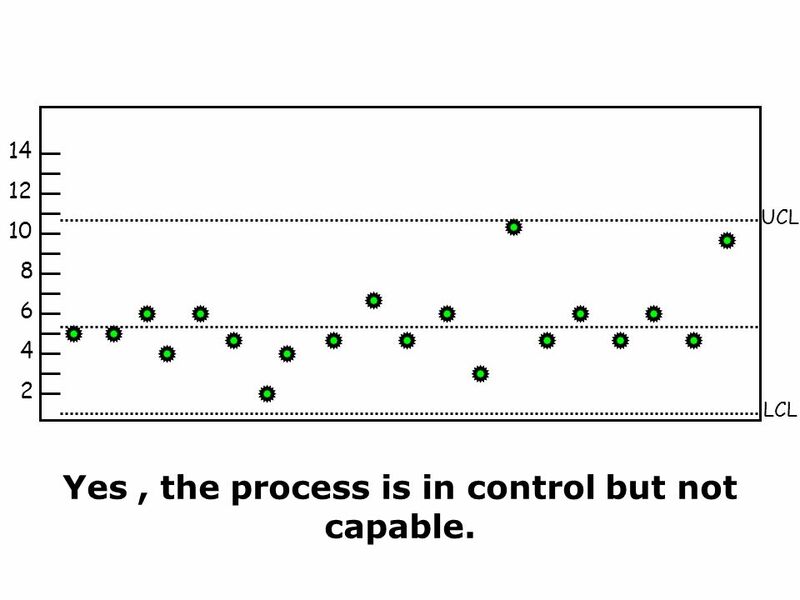 6-1 Is Process Stable ? 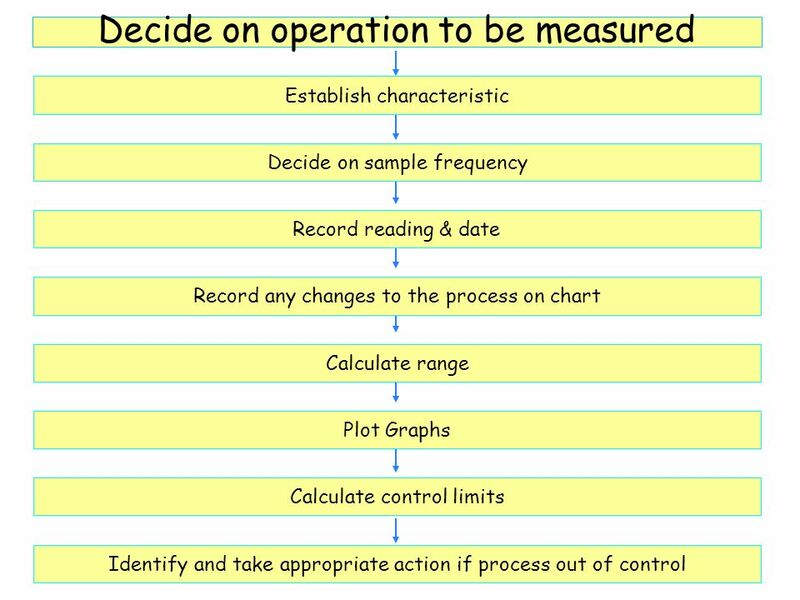 The Quality Improvement Model Use SPC to Maintain Current Process Collect & Interpret Data Select Measures Define Process Is Process. 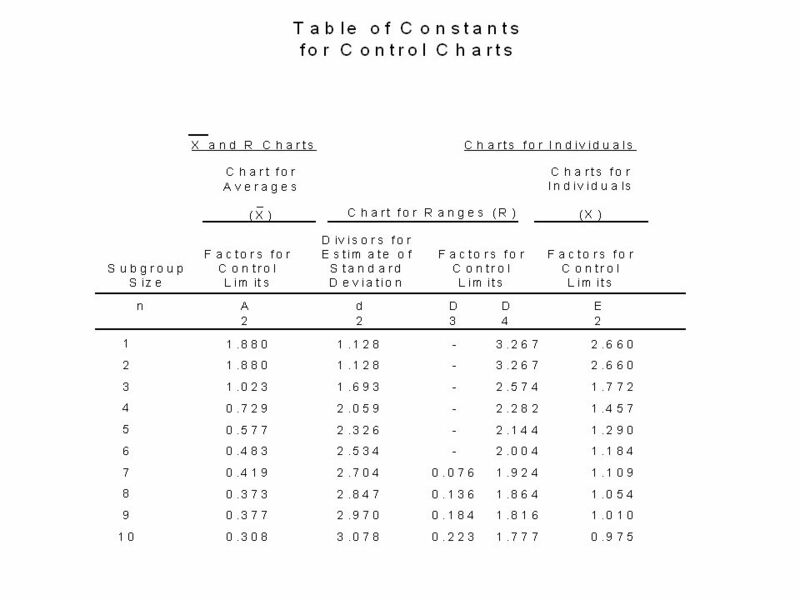 MANAGING FOR QUALITY AND PERFORMANCE EXCELLENCE, 7e, © 2008 Thomson Higher Education Publishing 1 Chapter 14 Statistical Process Control.